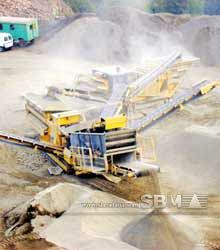 SBM Y series mobile screening plant is applied after materials crushing. Generally, there are four types of mobile screening plants. According to your crushing results and final requirements, you can choose from the four different screening plants. SBM Y series mobile screening plant is applied after materials crushing. Generally, there are four types of mobile screening plants, which are Y2S184GD8L, Y3S186GD10L, Y2S216GD10L and Y3S216GD10L. According to your crushing results and final requirements, you can choose from the four different screening plants. The SBM Y series mobile screening plant can process sand, gravel, and secondary aggregate, coal and landfill waste. You can use our mobile screens for processing virtually any material as long as it can be sized and sorted. Just like our mobile crushing plants, the mobile screening plants are also based on our long-time experience and know-how in crushing and screening. "We are satisfied with SBM mobile screening plant for our granite crushing plant."